​MLA 8: What to include? If you are a NEW NoodleTools user, click “SIGN IN” button on the upper right hand side of the screen. Then under ACCESS VIA G SUITE/OFFICE 365, type your Delsea email. Then "bubble in "Create a New Account". Then click “Sign In With Google" button. Choose “I am a Student or library patron”, then “Submit”. Under "Update Profile", select Delsea Middle School. ​Then use the drop down menu to select your year of senior graduation, then “Submit”. You are ready to create a "New Project". 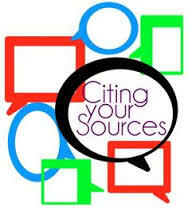 The "Sources" tab at the top will allow you to create a new citation. Creative Commons: Great to search for media, music, and images. Check out the usage terms in the CC license before downloading. Google Images then narrow search: Go to Google Images and search your term. Then click on Search Tools, Usage Rights, and click dropdown menu and choose Labeled for Noncommercial Reuse to narrow your search and yield the most results for usable images for nonprofit purposes. This is also available through Creative Commons. Open Clipart: Search for and use free images here. Pexels: Search for and use free images here. Pixabay: Search for and use free images here. Pics4Learning: Copyright-friendly images and photos. The Commons (Public Domain Photos and CC Licenses): This is a rich collection of photos started by The Library of Congress and Flickr. To find photos without a copyright, type in your search term, then look in the upper left hand corner ANY LICENSE drop-down and select No Known Copyright Restrictions. Another choice to select is Creative Commons or any of the other choices except for Any License. TinEye: Reverse Image Search: Upload an image or past the URL and find out where it came from or if modified versions/higher resolutions versions of the image are available. Wikimedia Commons: Community media sharing - Check CC license agreement and give credit before using images and videos for projects. This is also accessible through Creative Commons search. This set of short videos by Kevin deLaplante are guides to avoiding plagiarism, namely video #5,6,8-15. Another collection of short plagiarism videos you may find helpful. Purdue OWL: Is it Plagiarism? • keep intact any copyright notice associated with the work. This may sound like a lot of information, but there is flexibility in the way you present it. With a bit of clever formatting and linking it is easy to include all this information, particularly in the digital environment. Note: DMS teachers would like the three elements shown with the * included under the image. Some will require only the link. Make sure that what you want to do with the images and music is OK under the terms of the particular Creative Commons license it’s under. CC-licensed images and music aren’t free for all uses, only some — so make sure to check out the terms (you can find these by clicking on each image's and song’s license icon). Creative Commons licenses protect the people who use others' work, so they don’t have to worry about copyright infringement, as long as they abide by the conditions specified. Legal Music For Videos: Many musicians choose to release their songs under Creative Commons licenses, which give you the legal right to do things like use their music in your videos.